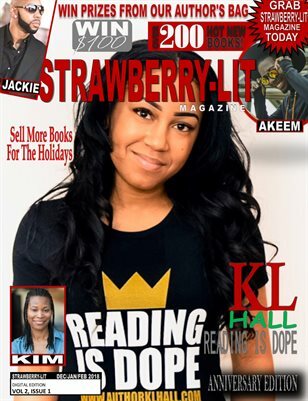 Strawberry-Lit Magazine sits down with Bestselling Author KL Hall as we discuss her writing style, releases, and how she became an Amazon Bestselling Author. Other interviews include "Underground" hit TV Show cast member Jackie Ray Bonds, children's author Kim Bailey, Barbados Native Akeem, and more. Win $100 in this issue. Win free stuff in our Author's Bag Giveaway. Check out new titles in our Cover Snapshots. See what our editors have to say in the Aspiring Author's Q&A. See what's the editor's advice for this issue, and enter win a free issue.